What do you buy a programmer for Christmas? Easy, a T-shirt. 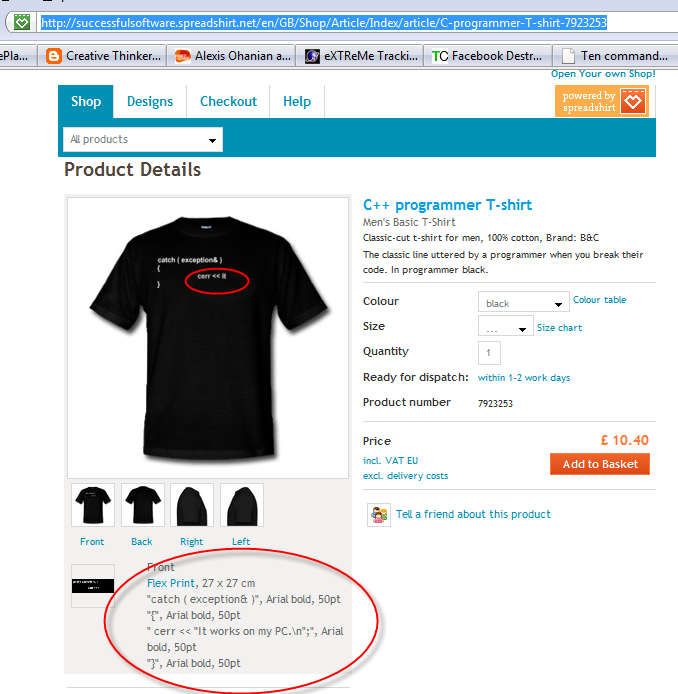 Programmers love T-shirts. It juuuuust so happens that I have created some T-shirt designs for software developers. Even better, all the commission will be split equally between two very worthy charities: jaipurfoot.org and sightsavers.org. $0.10 to protect someone from river blindness for a year. $10 to pay for eyelid surgery for trachoma. $35 for an adult cataract operation. I first heard of this charity while watching a TV program Paul Merton in India. This organization pioneered the “Jaipur foot” (also known as the “Jaipur leg”) – an effective and easy-to-fit prosthetic lower limb that can be produced for a little as $30 and is provided for free by the charity. The prosthetic was first developed in the 1960s by an orthopedic surgeon and a sculptor. Since then the charity has provided over 300,000 limbs in 22 countries. In the television program a young boy arrived at the clinic hopping on one leg and left running on two, beaming. It was moving to watch. You can read more in this Time magazine article. In these gloomy economic times it is easy to forget that there are people much worse off than ourselves. A little money goes a long way with either of these charities. So, how can you help? Buy a T-shirt for yourself, your geeky friends, your work colleagues or your employees. Currently there are nine designs available. I have set up separate shops for North America (zazzle.com) and Europe (spreadshirt.net) to cut down on postage costs and shipping times. Got an idea for a design? Add it in a comment below or email it to me. I will do what I can to turn some of the better ideas into T-shirts. You can supply graphics and/or text. I don’t have the artistic skills to turn your idea into graphics, but someone else might have. All commission from your design will go to charity. But your design must be original – no copyright violations please. If you have a software-related blog or frequent a software-related forum, please link to this post and/or the online shops. My “It works on my machine” machine design predates Jospeh Cooney’s and Jeff Atwood’s by more than 4 years, as proved by this link to the (now sadly defunct) ntk.net ezine. The profits from those T-shirts went to the Jhai foundation – pioneers of bicycle powered Linux. Ironically I can’t sell this design in the European shop due to a bug in the Spreadshirt.net code. These T-shirts are no longer available. Sorry. This entry was posted in miscellaneous, software, t-shirts and tagged designs, geek, programmer, software, spreadshirt, t-shirt, tshirt, zazzle on 25 November 2008 by Andy Brice.